Shirley Ferrill may be one of the new kids on the block in downtown Birmingham’s historic Fourth Avenue Business District, but she’s old school when it comes to helping in her community. 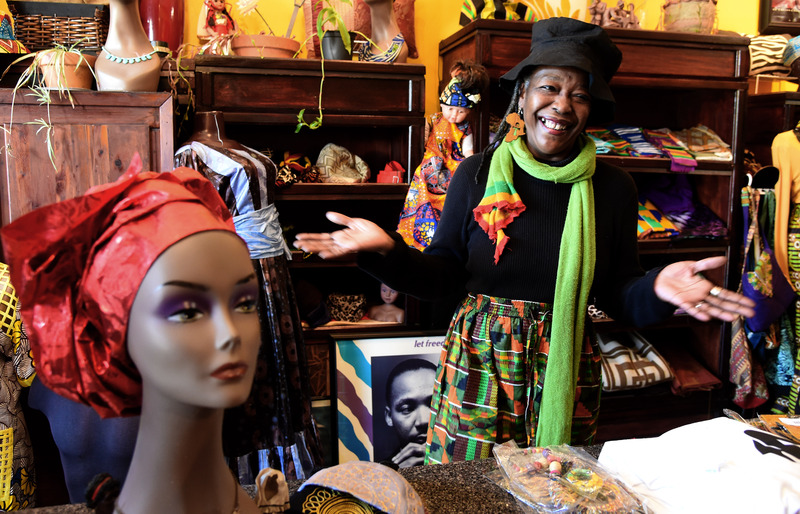 Ferrill, 65, is the owner of Ferrill African Wear at 320 16th St. N., which opened in November 2017. Ferrill does more than just sell attire: “I do fashion shows. I’ve done them at schools, churches, workplaces, on the streets, all of which generate conversations about where the fashions come from and … customs surrounding some of the pieces,” she said. For example, a gele is a headdress that is most common in West African countries, such as Nigeria, she pointed out. The Fourth Avenue Business District, which began to form at the turn of the 20th century, is a commercial area that stretches along 15th to 18th streets North, and from Rev. Abraham Woods Jr. Boulevard to Second Avenue North. It was known as the center for Birmingham’s black-owned businesses, which served black customers during the city’s long period of enforced segregation. Ferrill, a Sylacauga, Ala., native grew up the daughter of a seamstress during the Civil Rights Movement. Because of her mother’s work, Ferrill became interested in fashion. was much different than what she was wearing in the late 1960s, and she asked her mother to begin making some of the attire. 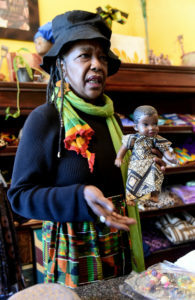 As she got older, worked, and raised a family, Ferrill—who has a son, a daughter, and three grandchildren—stopped selling African wear because sales were slow in Birmingham. 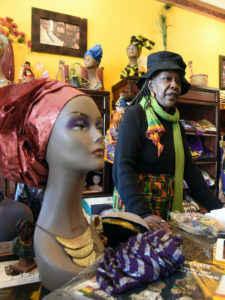 After retiring from several different positions in various fields, including unemployment services for the state of Alabama, human resources, and customer service, Ferrill returned to selling African wear, setting up vendor booths at different events at churches and schools then opening a storefront in Ensley in 2014. Space opened in the Fourth Avenue Business District, and Ferrill jumped at the chance to get it. Since relocating she has seen an increase in business. It also helps that the Fourth Avenue Business District is down the street from the Civil Rights District—all of which is downtown Birmingham, she said. The Birmingham Civil Rights District is an area of downtown Birmingham where several significant events in the Civil Rights Movement took place in the 1950s and 1960s. Among the landmarks in the area are the Sixteenth Street Baptist Church, Kelly Ingram Park, the Carver Theatre, and the Birmingham Civil Rights Institute. Ferrill said she sees a resurgence of young people wearing African clothing, even outside of Black History Month. “This store also gives me the opportunity to talk to young people,” she said. “I deliberately [find ways] to get more young people involved. … I use young models as early as age 2 [in my shows]. I also deliberately reach out to those in the young-adult age range because a lot of them are interested in modeling, so that’s one way to get them to wear African clothing. As a child of the 1950s and the Civil Rights Movement of the 1960s, Ferrill said she is honored to be a business owner in the historic district. “I was 10 the year the Sixteenth Street Baptist Church was bombed, and those girls were killed. I was so traumatized that for three months I couldn’t even go into a church,” she said. “To now be down the street [from the church], sometimes I walk down there just to reflect on the changes in my life and in my world since that took place. 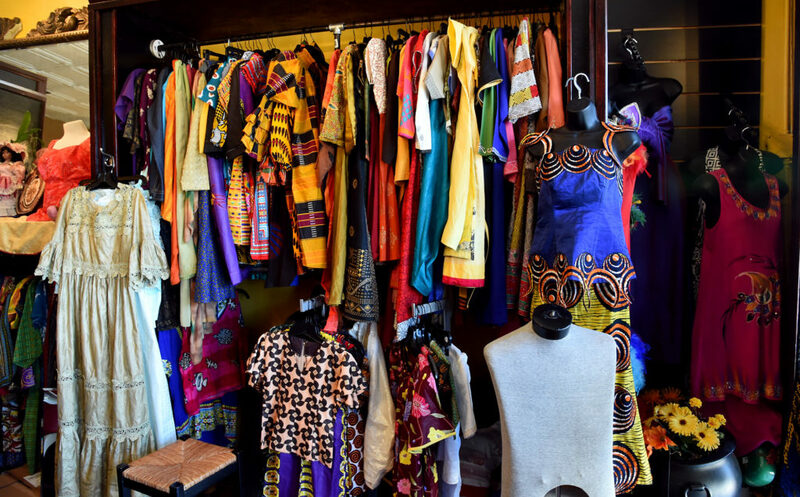 Ferrill African Wear is open from 11 a.m. to 5 p.m., Tuesdays through Saturdays. For more information, call 205-529-1182 or visit Ferrill African Wear on Facebook. Click here to read about some of the longstanding family businesses in the 4th Avenue Business District.